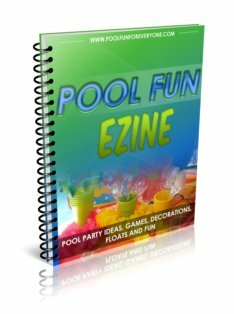 Looking for some cold salad recipes to serve at your next pool party? 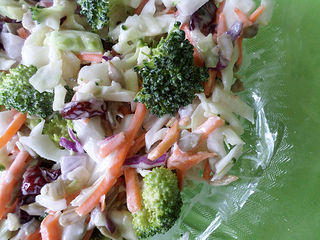 Cold salads can be used as a side dish or as your main meal. However, it is important not only for taste but safety to serve them cold. And you don't need an outdoor refrigerator to keep your salads cold. 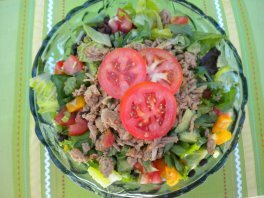 This easy taco salad recipe is good for you too! 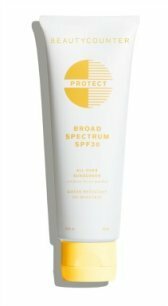 Filled with fresh and natural ingredients like black beans, avocados, orange peppers and tomatoes. When I can, I try to buy locally grown produce and if possible organic greens and vegetables. Instead of buying taco season packets to season my meat, I use Mexican seasonings such as fresh pressed garlic, cumin, onions and a little chili pepper. 1 lb of ground turkey browned with pressed garlic, onions, and seasoned with cumin, sea salt and chili pepper. Rather than adding the cheddar cheese into the salad mix, serve it in a side dish for guests to add their own. The best salad dressing (and healthy too) is your favorite salsa. Serve it with organic blue corn chips and you have a hearty meal. 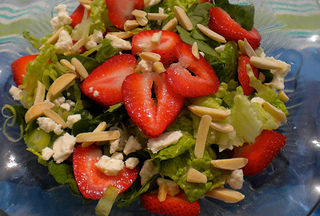 With fresh strawberries in abundance in the summer, use them in this cold salad recipe. I like to mix the greens so that the salad is half fresh organic spinach and half cut up romaine lettuce. The romaine provides a burst of freshness that is really appealing. Place cubed or crush ice in the bottom of the bowl and place the vented grate over the ice. Fill the rest of the bowl with your salad and place the lid on top for an attractive way to keep your salads from wilting. 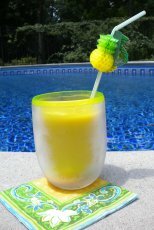 The high quality acrylic looks classy but is shatterproof making it a great salad bowl to use out by the pool. Last weekend we had friends coming over for dinner by the pool, but I needed to serve something that I could prepare for in advance. I was going to be gone all afternoon and getting in just about the time our guests were coming. 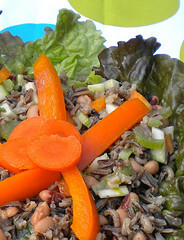 Mix the above and pour over the wild rice salad. I made the salad and added cut up grilled chicken and served it as the main dish with a cold bean salad and whole grain crusty bread and olive oil. 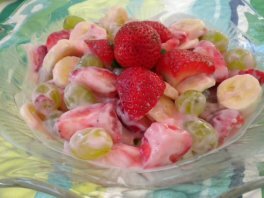 Do you need some easy fruit salad recipes? For entertaining adults and kids, fresh fruit salads are always a big hit. Make it with your favorite flavored yogurt - I used Stoneybrooks's organic strawberry cheesecake flavor. This recipe went over big at our latest pool party with lots of kids and adults. Mix with your favorite strawberry yogurt. I used Stoneybrooks organic strawberry cheese cake. Garnish with fresh strawberries. 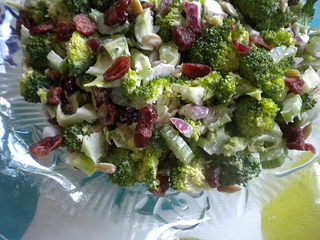 Healthy ingredients like broccoli, celery, and sunflower seeds make this summer salad a favorite at our house. I try to buy as many ingredients as I can organic for extra nutrition. Have you forgotten how easy and good tasting a Seven Layer Salad is? I did until my husband made a request and I wondered why I didn't make this salad more often. So easy - just layer your ingredients. Find out my easy tip for the dressing that eliminates one step. Another favorite cold vegetable salad is made with cucumbers and onions - crisp thin bites of cucumber make for a great side that can be served at any meal. 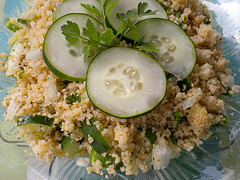 If you are looking for an easy to make crowd pleasing salad that also is healthy for you, a quinoa salad is it. I rarely make a pasta salad as we have several friends and family members who need food that is gluten free - and quinoa is. It is so easy to make and actually full of lots of good nutrition. Just like a cold pasta salad, you can add just about any type of vegetable you like - tomatoes, cucumbers, onions, carrots, etc. 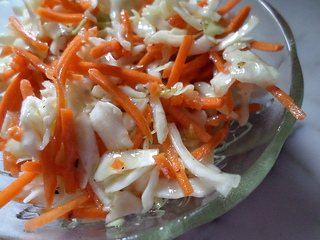 The key to making an easy coleslaw recipe is to buy shredded cabbage and shredded carrots. Mix together 1/4 cup of olive oil, 1/4 cup of white wine vinegar and 1 tablespoon of honey. Salt and pepper to taste. This is the first time I've used honey instead of sugar, and it tastes great. Mix dressing with the salad ingredients. Instead of a cold pasta salad, try serving a tabouli salad. 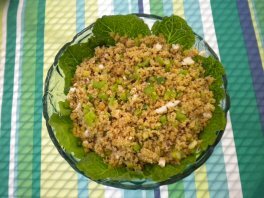 It is much better for you as the bulgar is whole wheat. It is a complex carbohydrate which means it won't spike your insulin. Stir in 1/4 cup of olive oil and 3 Tablespoons of lemon juice. Salt and Pepper to Taste. Mix all of the above ingredients and chill. Bean salad recipes offer a hearty side salad that can be prepared ahead of time. For you vegetarians this cold salad can be served as your main meal. 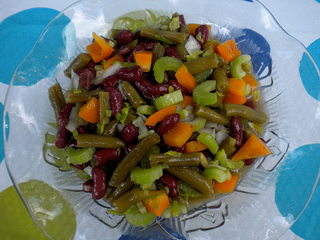 Bean salad recipes make a hearty side salad or main dish for you vegetarians. They need to be made ahead of time so that the flavors can mix. Which means if you have guests you don't have to make a fresh salad at the last minute. As a registered nurse, bean salads offer more nutritional value than pasta salads. 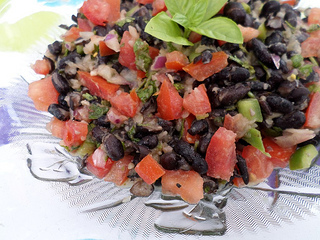 Try the traditional Three Bean Salad Recipe or the Black Bean and Corn Salad. Mix the dressing ingredients and pour over the bean mixture. Make the day before so that the flavors are all enhanced. Rinse and drain each can of beans. Combine beans, bell pepper, onion and celery in a large bowl. Whisk together vinegar, olive oil and sugar. Pour vinegar mix over the vegetables and toss lightly. Cover and refrigerate for several hours or overnight. Add 1/4 cup orange pepper for color and variation. Season with salt and pepper to taste. It can it can keep in the refrigerator up to one week. This is a good make ahead salad. Black bean and corn salad is a hearty salad that can be prepared in advance. Whisk together the vinegar, oil and lime juice and salt and pepper in a large bowel. Add the corn, red pepper, black beans and onion and toss. Cover and chill for 2 hours. Add the cilantro just before serving. 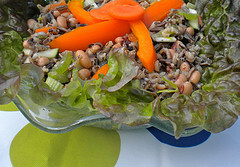 I love using a variety of different grains for summer salads. Couscous is one of them. 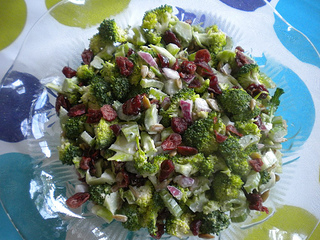 This easy to make salad comes in a box with the seasonings already included. Add a few simple ingredients and you have an easy to make, but delicious salad. t's a perfect side dish to serve with grilled hamburgers, brats or salmon. Refrigerate for 2-3 hours before serving. 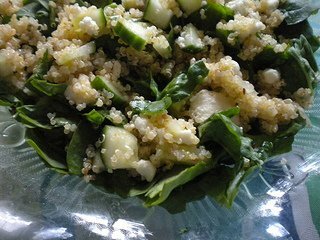 Line the bowl with fresh Romaine leaves and then add the couscous salad. Add these cold salad recipes to your pool party food favorites.